Tyrone McKenna is chomping at the bit to perform in front of his adoring home fans at Ulster Hall on Friday night. 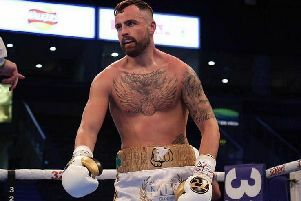 The Mighty Celt’ was last seen battling to a points victory over MTK Global team-mate Lewis Benson in Glasgow and now returns to his home city, where he shared an entertaining war with WBO No. 1 contender Jack Catterall last summer. “I’m back where I belong. I love fighting in Belfast. I’m there to do a job and I have to take my opponent seriously and put on the big performance everyone’s expecting. “The Ulster Hall is magic. It’s that simple. For atmosphere, it’s second to none. The crowd is on top of you. “So many great fighters have fought there and to be a part of that history is very special. “This will be a more straightforward bout for me than my last two. My last two have been wars. “This guy shouldn’t be going the distance with me. I’m excited to showcase my talent and skills. “The one thing I am aiming for is a spectacular knockout. That’s what the crowd want to see and I want to finish this in style. “We were all inspired by our team-mate Sam Maxwell the other night. “His knockout was unbelievable. I was having palpitations all through the fight. “ He was hurt in every round and to pull out that knockout in the last 10 seconds was unreal. McKenna is joined on the Belfast bill topped by the WBO European title rematch between Conrad Cummings and Luke Keeler by the likes of Sean McComb, Gary Cully, Steven Ward and Steven Donnelly.